There are two days left before the big client presentation and you've been preparing for it for almost a month now. You're working through the last bit of feedback from your team and tweaking the content of your slides when you start questioning if you'll even be able to deliver the deck flawlessly. Will you be able to seamlessly transition between the deck and the high-resolution video you've prepared? Will you even have Internet access in the conference room from where you'll be presenting? It's these last-minute challenges that can turn you from a powerful persuader into an incoherent mess, relying on a variety of verbal fillers as you struggle through a cringe-inducing delivery. Once you have the PDF, you must convert each page to an image that you will embed in your Keynote document. While this seems like a tedious process of exporting each image as a JPEG, I have created an Automator application (download it here) to make this really simple. When first launched, it asks for the location of the PDF document to convert and then stores this value in the Filename variable. Similarly, it asks for the destination directory for the exported images and stores this in the ExportPath variable. 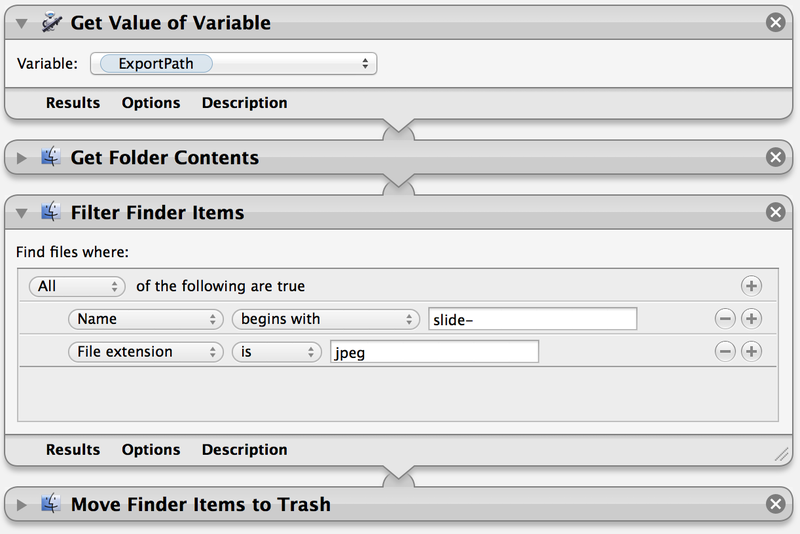 Once setup is complete, the application removes all images matching a specific pattern from the ExportPath directory. I chose a very specific filter in the event that a user inadvertently chooses the incorrect location (their home directory, for example). This is where the real work happens. 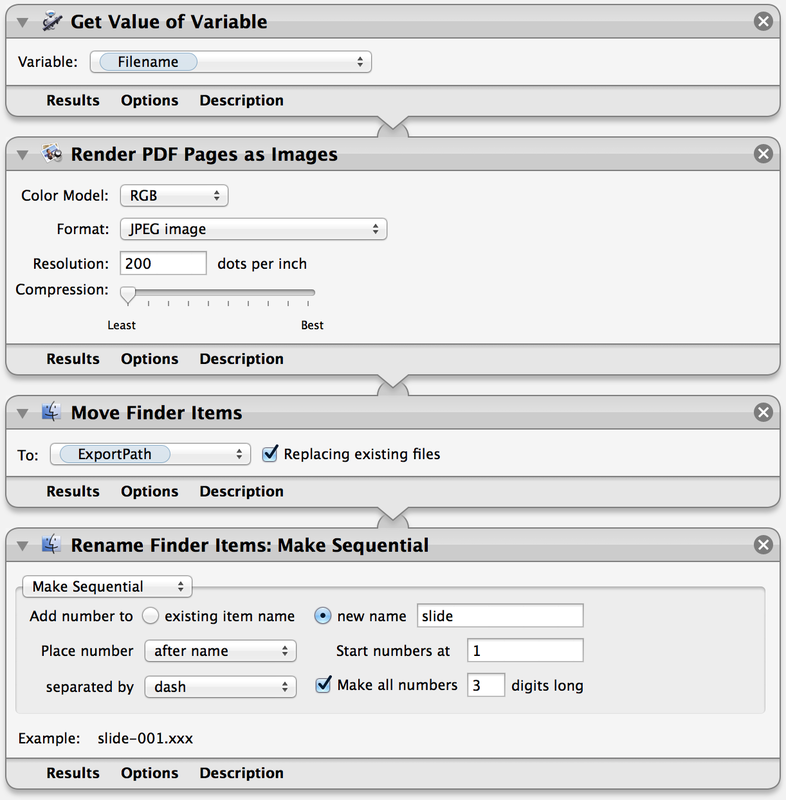 Each page in the PDF document specified by Filename is converted into an image (maintaining the original quality by using the least amount of compression), is then moved to the target directory specified by ExportPath, and is sequentially renamed to preserve the slide order for easy importing into Keynote. 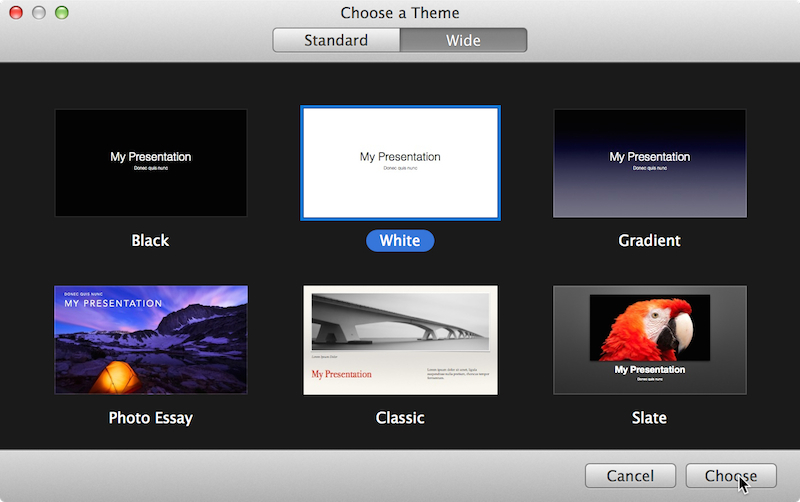 You now have a Keynote deck ready for your final style edits. Take note of the duration of your video and select the 'Animate' icon from the toolbar. 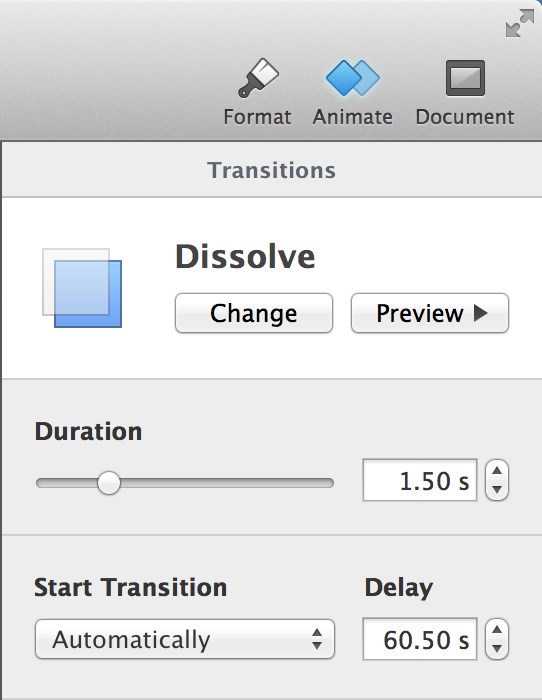 Add the 'Dissolve' effect and have it automatically transition after the video has finished playing by setting the delay equal to the duration of your video. Once the transition is set, drag your video into the slide, resize it to fill the entire slide (if appropriate), and have it automatically start playing on transition. Do this by selecting the 'Format' icon in the toolbar and de-selecting the 'Start movie on click' checkbox under the 'Movie' tab. Test your work by starting the presentation from the slide before your video. If you've done everything correctly, clicking will advance to the video slide, the video will automatically play, and the next slide will fade in after the video completes. Unnecessary flourish distracts from the content and delivery of your presentation, so really take time to analyze whether complex transitions are supporting your delivery or distracting from it. If you're able to eliminate a majority of these transitions, re-adding the critical ones to your Keynote document will be quick work. Notes are useful when you're working through drafts of your presentation, but when it's time to present it in front of your audience you should really know your material inside and out. Ditch the notes, mirror your displays, and nail that delivery. Those caveats aside, we've found that this approach gives us the best of both worlds: effortless collaboration with Google Slides and worry-free presentation with Keynote. The next time you're planning a presentation, give this a try.